When Legends Of The Knight was first released in a handful of theaters in February, all the proceeds were donated to local charities. On November 18, the documentary will be released on DVD, capable of inspiring the rest of us with the power of Batman’s heroic, and human, story. The feel-good film weaves together uplifting true stories of individuals who have embraced their inner superhero to overcome obstacles — or unselfishly given to their communities — because of their love for the Caped Crusader. In additional to the more personal stories, the film features interviews with people who have been involved with Batman’s rise to dominance over the years, including Michael Uslan, executive producer of the blockbuster Dark Knight films. Through the deeply personal tales of Batman fans, writers and filmmakers, this 76 minute film encourages viewers to find their own uniquely courageous paths — like Lenny Robinson did. The Baltimore man regularly dons full costume and visits sick kids in children’s hospitals, arriving in a black sports car resembling the Batmobile. 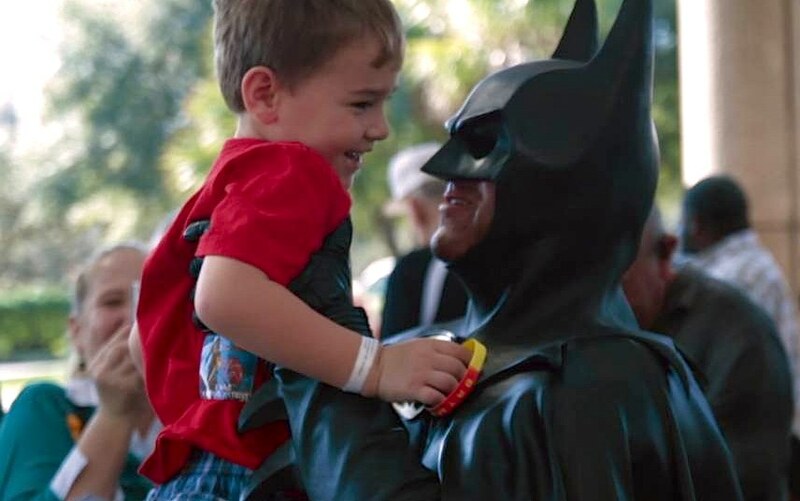 5-year-old Texan Kye Sapp is an example of the downhearted who can gain strength by identifying themselves with Batman. After being diagnosed with leukemia, he was given a chance to save his city, as Batman would, through the organization Wish with Wings in 2012. Because the Gothem City comic book character has no actual superhero powers, Rabbi Cary Friedman was profoundly impacted since childhood. It motivated him to write the book “Wisdom from the Batcave: How to Live a Super, Heroic Life”, which expresses the life lessons & moral teachings in Batman tales. As a professor, Dr. Travis Langley has even taught a Batman course that illuminates the field of psychology through the characters & stories of Batman. Meet these and other Batman fans and heroes by pre-ordering a DVD copy of Legends of the Knight, the film that was funded by more than 1100 people from around the world as a way to keep alive our childhood dreams of becoming a hero.